I’ve been willing to write about Michelangelo Antonioni’s Masterpiece. It’s just that when you sit down to describe and reflect upon such a monumental artwork, you need time and patience to be able to focus on the most important conclusions. For me it is always important to see the consequence of implications which you get from a movie. And I am pretty sure that “The Passenger” is indeed one of the best film I have ever seen. The psychological drama about loneliness, alienation and the trouble of finding one’s identity stars Jack Nicholson as a television journalist who assumes the identity of a dead arms dealer in Chad and then escapes his own identity and life cycle. We witness the typical 1970’s movies feel of losing something real while trying to live the life. I am unsure if this film’s intelligent script would’ve had the same impact if there were no such beautiful landscapes which complement the psychological transformation of the main character David Locke. The cinematography by Luciano Tovoli is distancing the characters of the film one from another. A deliberate alienation which represents a person’s desire to escape oneself. Losing his identity Locke finds during his journey a soul mate – an architectural student in Barcelona (Maria Schneider). We witness their unconventional relationship and route through exotic and deserted villages and cities. At the same time Locke’s real life (represented by his unfaithful wife) tries to reach and find him. The main character is deliberately avoiding being found and desperately is trying to not go back to his original existence. France and especially Spain present us with both fascinating and haunting images of nature and architecture. 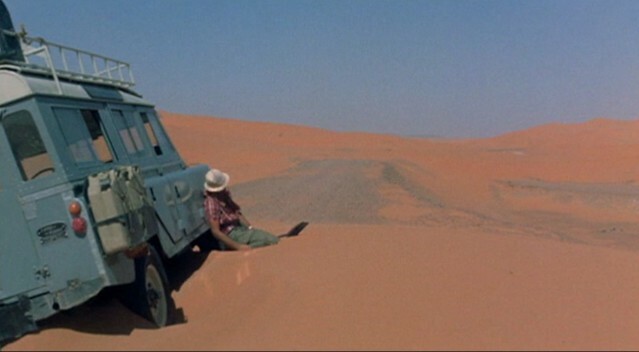 It is very important for the viewer to notice Nicholson’s character being “blown by the wind” from one deserted place to another. David Locke is a traveler through time and space who is attracted to his young female companion and spiritual soul mate, but ultimately is troubled only by his own escapade. And although his new arms dealing identity finally takes its toll, he is presented as a newborn soul, freed from the constraints of his ordinary life. This alienated freedom provokes many viewers to try to find what is not right in their own lives and reflect upon how to change that.